For patients with persistent back pain and neck pain which have not responded to manual therapies, particularly disc-related conditions, at Theale Wellbeing Centre near Reading, we provide advanced IDD Therapy spinal treatment programmes. 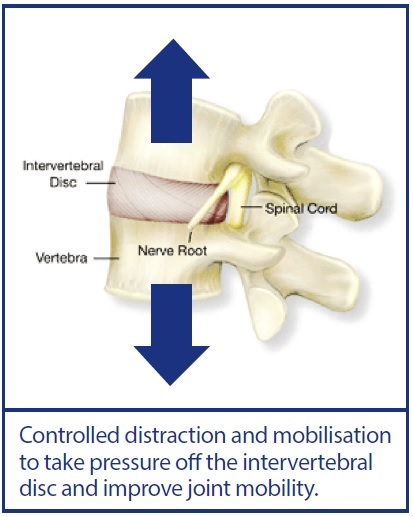 Intervertebral Differential Dynamics (IDD) Therapy is a safe, non-invasive and effective method of treating back pain and, more specifically, “slipped”, bulging or prolapsed discs. The treatment is targeted at specific segments of the spine and may relieve the pain arising from disc problems and sciatica. IDD Therapy can be used to treat problems in the neck and lower back. We use IDD Therapy to reduce the pressure on the intervertebral discs and the adjacent nerves, reduce muscle tension and increase mobility. We can measure the changes in range of movement extremely accurately using ViMove technology. ViMove is state of the art technology and allows us to monitor progress and tailor our treatment with greater precision. When we review our patient’s MRI scans and reports it often becomes apparent that their symptoms originate from a specific spinal segment. IDD Therapy gives us the ability, using the SDS SPINA machine, to gently draw apart (distract) the affected segment. The pulling forces are computer controlled and the intensity of the treatment can be varied to ensure that the treatment is both comfortable and effective. Patients very rarely find treatment painful, in fact many people tell us that they feel very little discomfort at all whilst they are on the machine. An additional benefit of IDD Therapy is that it can reduce muscle spasm and stretch out stiff muscles and ligaments. This allows greater freedom of movement and promotes a more rapid recovery. Alongside the treatment we will also recommend a exercise programme, designed specifically for each individual, to maintain the improvements in range of movement, increase the strength of the muscle which support the spine and promote the relaxation of muscle spasms. We may also suggest some deep tissue massage or osteopathic manipulation. Most patients will require a course of treatment but the number of sessions is dependent on many factors and a detailed, bespoke treatment plan is drawn up at the initial consultation. We offer a free 15 minute consultation to assess your suitability for IDD Therapy. We are based in Theale, near Reading in Berkshire. We typically see patients who have tried a wide variety of therapies with limited success. Often these people are taking a lot of strong medication and may have been told that they require injections or surgery to alleviate their symptoms. “Here at Theale Wellbeing Centre , we are committed to providing a variety of safe, non-invasive treatment options for our patients. IDD Therapy allows us to treat patients with severe, complicated, chronic conditions which aren’t responding to manual therapy, exercise programmes or medication. Theale Wellbeing Centre is part of a UK and international network of IDD Therapy Spine Centres who are passionate to do everything they possibly can to get patients out of pain and enjoying life to the full. We are situated in Theale, near Reading in Berkshire. To find out your potential suitability for IDD Therapy treatment or to discuss your condition, we offer a free 15 minute consultation at the clinic. Note: As with all treatments results vary depending on the nature of your condition and IDD Therapy treatment is one treatment tool we use. As part of your assessment we will advise you on the most applicable treatment for your individual needs and as appropriate we do occasionally refer patients to local consultants.